Planning my road trip to Yellowstone National Park, the very first national park in the USA and one of the most visited national parks in the USA, for Memorial Day long weekend in May was daunting. Yellowstone is HUGE and there are several entrances, and it’s expensive to visit in the summer. High season is June through August so it’s best to plan your Yellowstone vacation trip in advance. Use this guide as the beginning planning stage for your trip. I’ll publish suggested itineraries soon. And if you plan to visit both Yellowstone and Glacier check out my guide to visiting Glacier National Park. 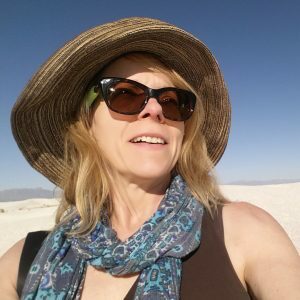 Check out my 5 BIG reasons to visit Yellowstone park! Luckily, I enjoy traveling with no definite itinerary. Although I made a list of attractions and places I would like to see, I didn’t have a set itinerary for the 4 days I would be visiting. 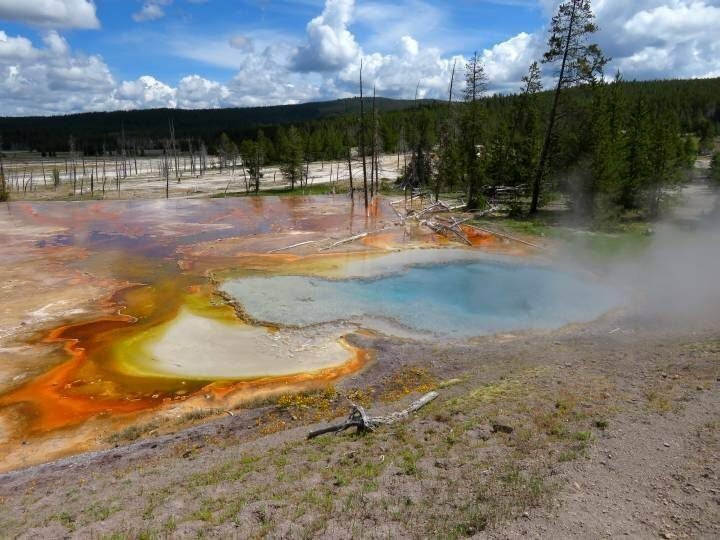 I knew I wanted to see Grand Prismatic Spring, geysers, waterfalls, and wildlife but I did not prepare a day to day itinerary. For the people that like to plan ahead and have an itinerary in place, this post should help you work out some of the details for your adventure. This article serves as a starting point to plan a trip to the park. 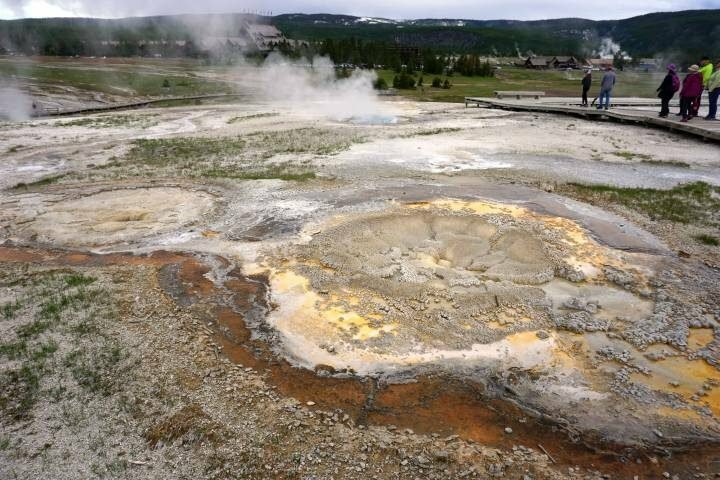 Following are some of the most frequently asked questions about visiting Yellowstone to help you plan your vacation. What towns and cities are close? Where is the entrance to Yellowstone? How much does it cost for the entrance fee? What type of wildlife could I see? Do I need to bring bear spray? 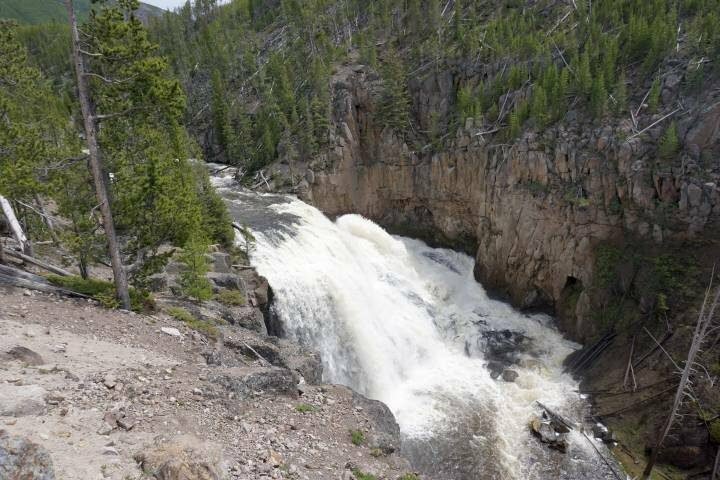 What is the name of the river in Yellowstone? What are the most beautiful waterfalls in the park? How many days to see the attractions? How much do campsites cost? 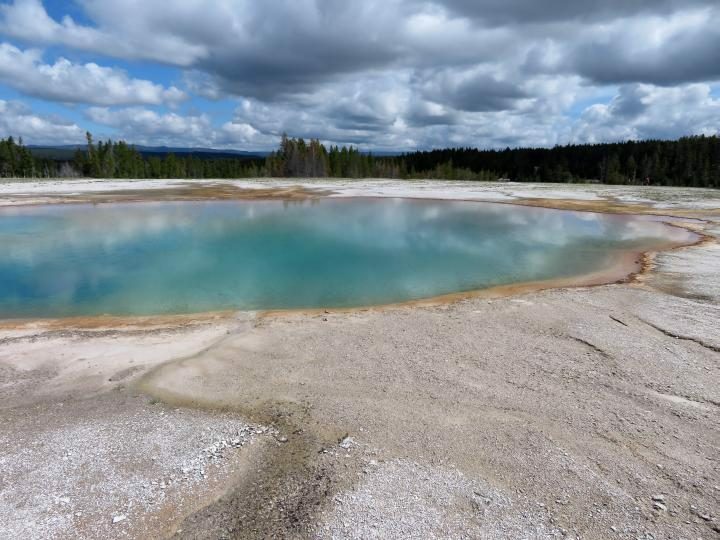 Can I park my RV in Yellowstone? Are there hotels in the park? 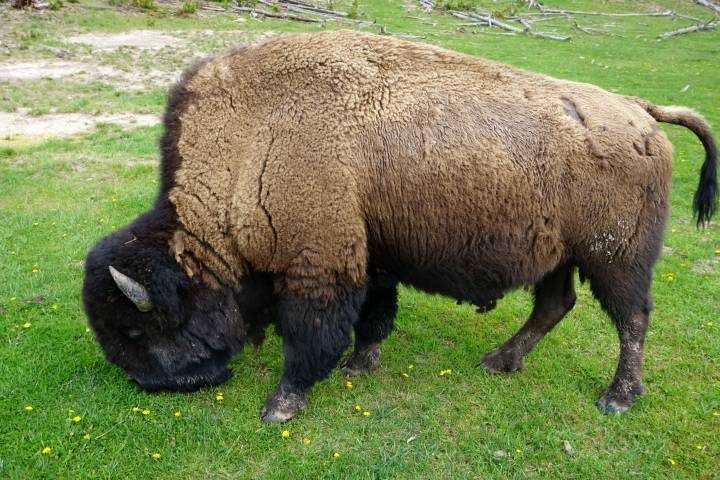 Is there food available in Yellowstone? 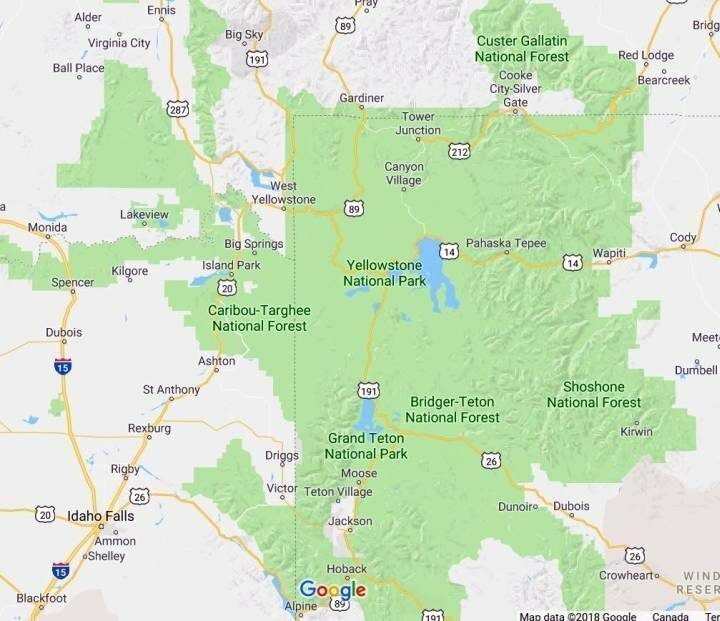 Where do I find a map of Yellowstone National Park? 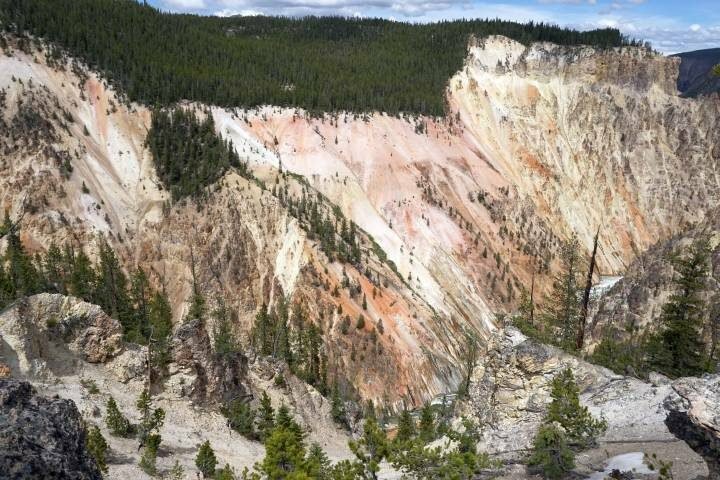 Is there a volcano at Yellowstone National Park? What is the best time to visit Yellowstone? 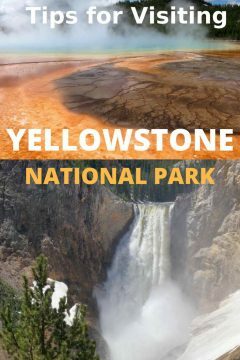 What are the best guide books for Yellowstone National Park? Roads in Yellowstone have different opening and closing dates each year. The National Park Service Yellowstone website has a page devoted to roadways in the park. There are webcams on the NPS site for the North and West entrances so you can check traffic conditions anytime. You can call 307-344-2117 for recorded info on roadway status and which roads are already open to bicyclists in Yellowstone. Primarily in northwestern Wyoming. There is a small portion of the park in southern Montana as well as eastern Idaho. 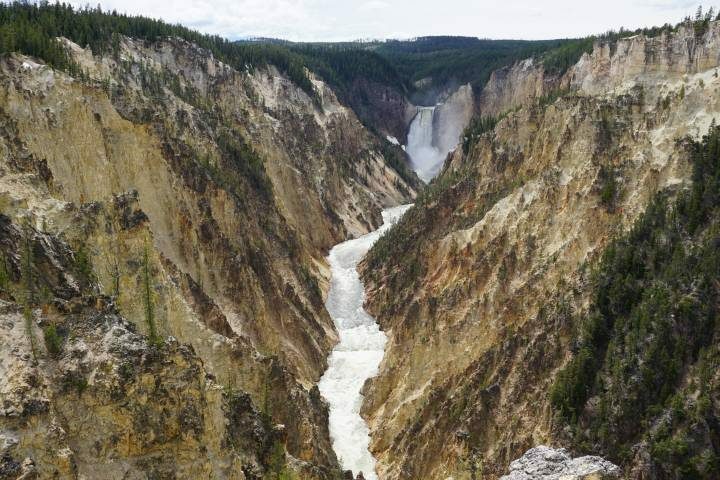 Did you know that Yellowstone was the very first National Park in the United States? Established in 1872 by the US Congress and officially signed into law by President Ulysses S. Grant on March 1, 1872. 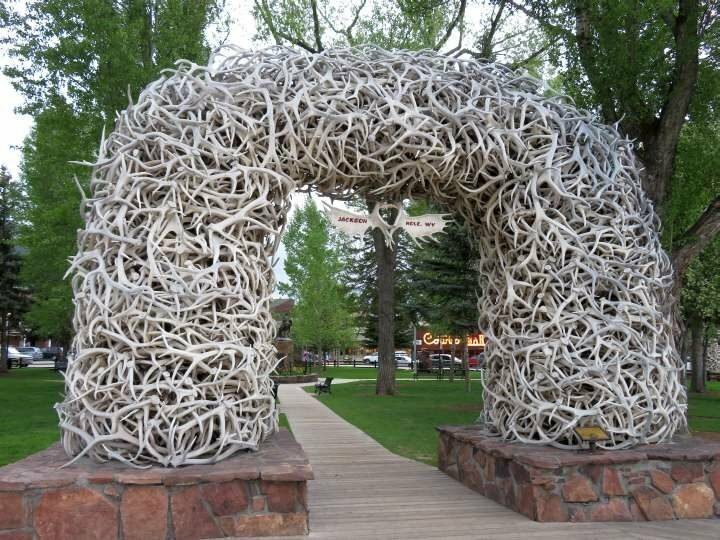 Jackson Hole is the closest airport and the airport code is JAC. Almost 3,500 square miles. That’s about the size of Puerto Rico! You can pay the Yellowstone entrance fee with cash, debit card, or credit card at the park gate. 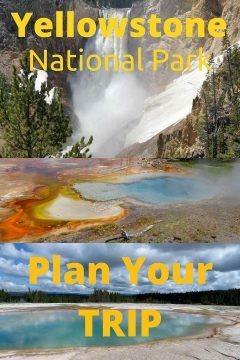 Or use the Yellowstone NPS Your Pass Now website unless you want the America the Beautiful, Seniors annual pass, or Seniors Lifetime pass – you can buy those online here. July and August the park is open 24 hours with all roads, facilities, and services are opened. All other months there may be closures at some facilities, services, or roadways. Check NPS for the most up to date opening times, road closures, facilities open – every year the dates vary depending on the weather conditions. There is limited access. Pets are not allowed on trails, boardwalks, backcountry, or thermal areas. You cannot tie your pet to a fence or tree, or leave your pet unattended at the park. There are no kennels within Yellowstone but there are kennels in nearby towns. Qualified service animals are allowed in the park, but they must be leashed. See NPS site for definition of service animals. Wildlife watching is one of the key attractions at Yellowstone. Yes, you are likely to see wildlife while visiting the park. Wild animals are unpredictable and can be dangerous. Always keep a safe distance from wildlife in the park. Use your binoculars or a telephoto lens on your camera to view wildlife from a safe distance and to avoid disturbing the wildlife. 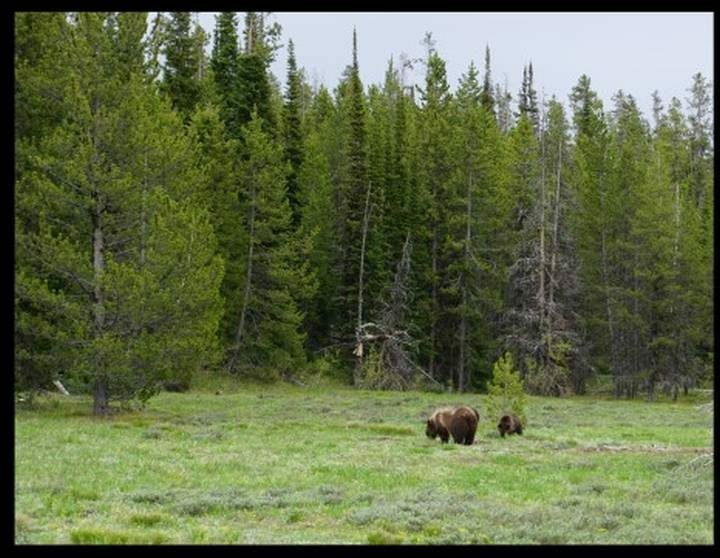 Stay at least 100 yards (91 meters) from bears or wolves, and 25 yards (23 meters) from other wildlife while in the park. Yellowstone grizzly population is approximately 690. In 1975 the US Fish and Wildlife Service listed the grizzly bear in the lower 48 states as threatened with extinction. At that time the grizzly population at the park was 136. In 2017 the US Fish and Wildlife Service removed grizzlies around Yellowstone from the protected list. You may have heard about a plan to allow hunting of grizzly bears in 2018. Just days before the hunting season is to begin, a federal judge has halted the grizzly bear hunt for 14 days. Later, a federal judge ruled that the Fish and Wildlife Service erred in removing protections for the grizzlies. Full protection to the grizzly bears under the Endangered Species Act have been restored. It’s your choice but when you are in bear country it is best to be prepared for a bear encounter. That includes having bear spray and knowing how to use it properly. A grizzly bear attacked a 10 year old boy hiking with his family on Thursday August 23, 2018. 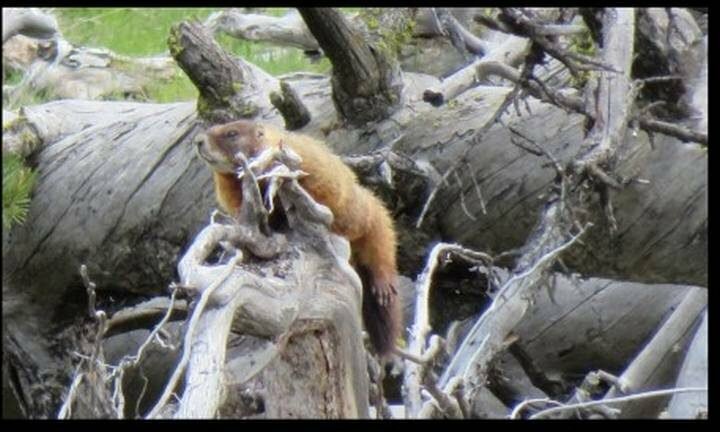 The boy survived the attack and National Park Superintendent Pat Kenney stated “This incident could have been more serious. We applaud the family for travelling in a group, carrying bear spray, and knowing how to effectively use it”. While grizzly bear attacks are rare you have got to be prepared. Watch the video on NPS website and learn how to use bear spray correctly. Yellowstone River is the largest river in the park. That’s one you can remember for sure. 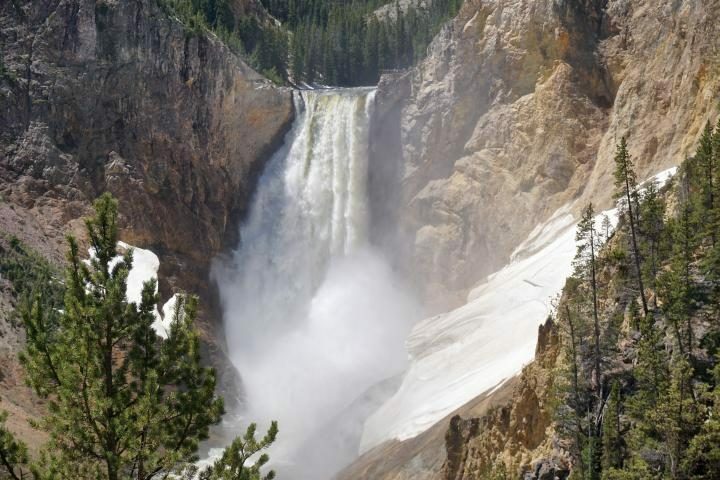 Here’s my list of gorgeous waterfalls at Yellowstone. The most beautiful waterfall is the one you are watching when you are there, enjoy! Depends how many bison traffic jams you experience. Seriously, there are traffic jams due to the free-roaming bison herd on the roadways. To see the most popular attractions you need about 3 days in the park. Long weekends are very popular times for visiting the park so expect lots of traffic. For my trip I arrived on Saturday afternoon and left on the following Wednesday so 3 full days plus an afternoon/evening. 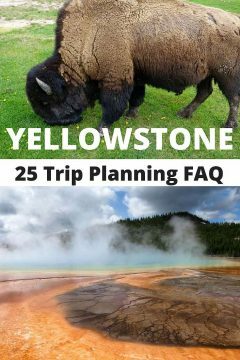 You can do Yellowstone in 3 or 4 days without feeling rushed. Keep in mind that weather and crowds/traffic could hamper your plans, so try to plan an extra day or two to accommodate conditions that are beyond anyone’s control. Also consider the location where you are staying and how much time you will spend driving to and from the park. For instance, I stayed at the Mountain Modern Motel in Jackson which is 64 miles from the south entrance. Driving time depends on other traffic, bison or other wildlife on the roadway, weather conditions, and how many times you stop to snap pictures along the way. Plan accordingly. Campsite fees range from $15 to $30 (except for Fishing Bridge RV park – see below) and there are over 2,000 campsites. Check out campground details here. Reservations are allowed at 5 of the 12 campgrounds, while all others are filled on a first-come first-served basis. There are also backcountry campsites for a fee of $3 per person per night but it maxes out at $15/night so groups of more than 5 still only pay $15 per night. Fees apply to persons age 9 or older. Fees are only charged between Memorial Day and September 10th. If your trip begins before Memorial Day or after September 10th there is no fee charged. If you plan to do a lot of backcountry camping buy the annual pass for $25. Click here for Backcountry Permit Reservation form. Only some of the backcountry campsites are available by reservation. Fishing Bridge RV park is the only campsite with full services for RVs: water, sewer, electrical (50 amp) and no tents or tent trailers are allowed at the campground. There are 9 hotels in the park. In winter only 2 are open, but spring through fall all 9 lodges are open. No worries, you will not starve even if you did not pack a picnic lunch. There are several restaurants, stores, and visitor centers with food available for purchase in Yellowstone. Weather is unpredictable, especially near the Rocky Mountains. During high season and summer months, the weather is usually pleasant but be prepared for a variety of weather. In late fall, winter, and early spring the weather will be more erratic. Winter turns the park into a wonderland of snow with few visitors. It depends what you are looking for and and how much time your have. Here’s a list of hikes to get you started. Snowmobile and snowcoach tours – I met a couple that visited the park in winter, Angie and Sam said they loved the snowcoach tour. Go to any of the 9 visitor centers within the park to get a map. Most hotels in the area also have maps so be sure to ask when you check-in to your hotel. 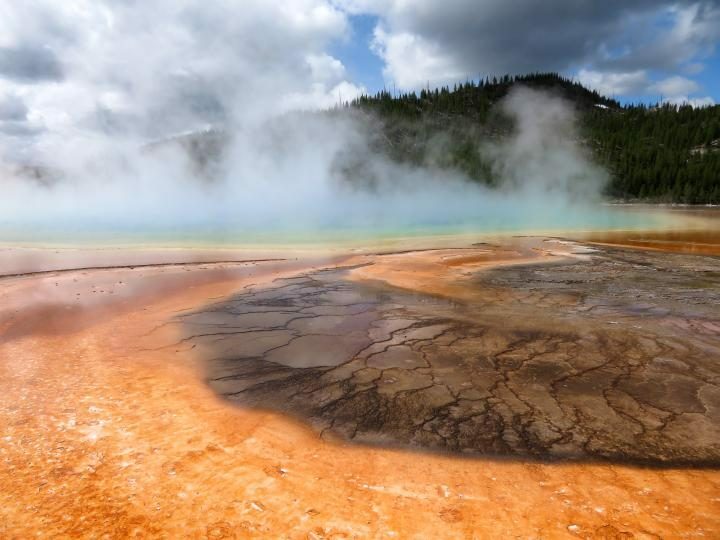 Yes, Yellowstone is a dormant super-volcano, and it could erupt again. Scientists believe the last eruption was approximately 640,000 years ago. When will the next super-volcano eruption occur? Could be sooner than you think! 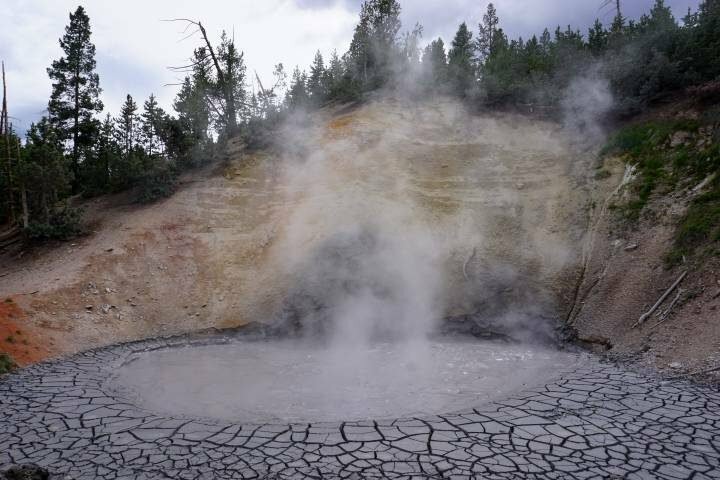 You may have heard that Steamboat Geyser erupted an amazing 8 times in 2018 already 31 times in 2018. Amazing because prior to these eruptions Steamboat geyser’s last great show occurred September 3rd 2014. Steamboat is the world’s tallest active geyser with eruptions shooting water more than 300 feet. Watch a video of Steamboat Geyser erupting – go to time stamp 5:27 and 7:39 for the most dramatic coverage. Steamboat Geyser is located at Norris Geyser Basin which is close to Highway 89 and Norris Canyon Road, around 27 miles (43 km) south of Gardiner Montana and the North Entrance. All this thermal activity has scientists speculating that another super-volcano eruption could be coming soon. April and May and September to November are less crowded and usually have pleasant weather. July and August are the busy season. When kids are out of school and during long weekends are popular times for vacations to Yellowstone. Winter is the least crowded time to visit the park. Hotel prices are cheaper. The snow looks beautiful. Here are 10 of the top books to help you plan your trip. The north entrance is open to wheeled vehicles year round. Around mid-December the park opens to the public for motorized snow travel. There is a catch though, this includes commercial snowcoaches and snowmobiles entering the park at West and South entrances. Most visitors to the park in winter use a guided tour to enter the park. But you can use also apply for a permit to enter the park on non-commercial snowmobiles. All non-commercial snowmobile traffic, groups up to 5 snowmobiles, must apply in August for the permit lottery – results announced in early September. Any permits not filled through the lottery will go to Yellowstone visitors on first-come, first-served basis. 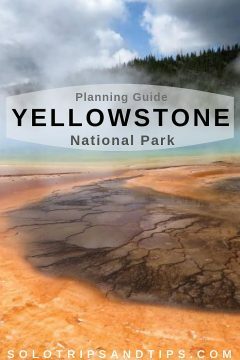 I hope this guide helps you to plan a trip to Yellowstone and enjoy all the beauty and wonder at the park. This is one of the most amazing places to visit in the USA. Big Bend National Park Hiking Trails - Which are Best for Solo Hikers? Wow. This was a really comprehensive post. Yellowstone has been on my radar for years ever since visiting Moab so I was really interested in knowing more. I was quite impressed with all the information you had. Great work!